The DJC published photos of Flatiron, the under construction office building at N Mississippi & Cook whose shape is “reminiscent of the iconic Flatiron Building in New York City“. 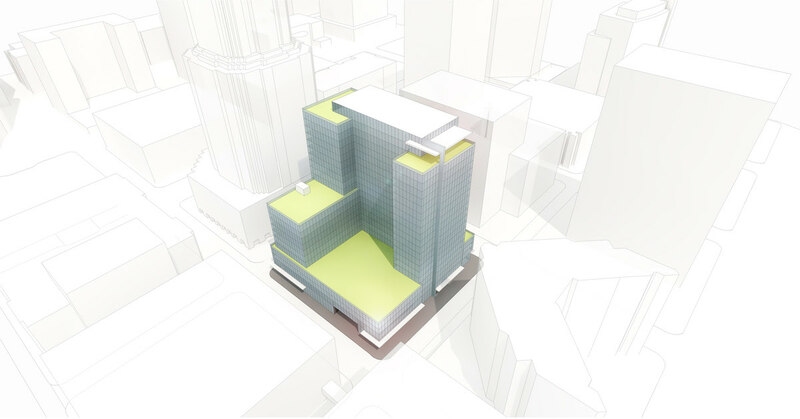 Portland Architecture wrote about two proposals for two developments with buildings far taller than currently allowed: Kengo Kuma’s Riverplace Redevelopment; and the William Kaven proposal for the Post Office Redevelopment. The Oregonian reported that Oregon State University will occupy the second floor of the re-purposed Meier & Frank Building. 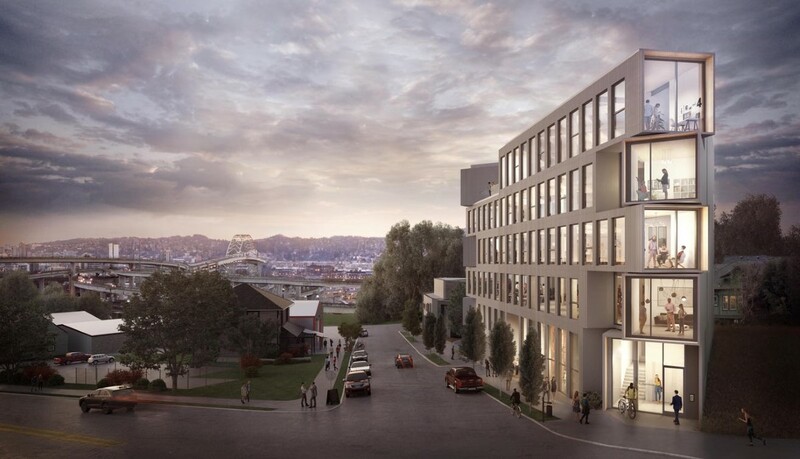 The Business Tribune reported that Portland-based ZGF Architects was named the #1 ranked firm for sustainability in the nation by Architect magazine. New 6 Story mixed use 208 unit apartment building with residential, retail and parking on first floor with one level below grade parking for approximately 129 vehicle spaces. Develop site into a storage facility. The site currently is a parking lot with two small commercial buildings. New mixed-use, multi-family residential building with possibility of daycare and cafe (at street level) to serve OHSU community. Type III Conditional Use Review – Intention at this time is to be vested under the current code; information to complete the application will be provided at a later date within the allowed 180-days. new six story residential projecton a three-block conditional use site. Development includes one level of below grade parking to be operated as commercial use (maintaining parking for the cathedral) and a partial level at-grade to support residential units. New six story residential project with one level of below grade parking to be operated as commercial use (maintaining parking for the cathedral) and a partial level at-grade to support residential units. Proposed development is located on a three-block conditional use site which will be submitted separately. New mixed-use building with below-grade parking. New construction high-rise mixed-use housing with ground-level retail, housing lobby and service functions and above grade parking. Construction of a new five story, 56,558 square foot multi dwelling building. Proposal includes Eighty units and a parking a garage. The proposed development is on a site with an existing office building and surface parking lot which will remain. Proposal for a new 94-unit, 6 story mixed-use apartment building. 14-story building (occupying half of a city block). The site is currently asphalt surface parking. Building will include 2 levels of below-grade parking, commercial retail at grade, hotel suites at levels 2-4, residential dwelling units on 5-13, and hotel amenity at level 14. Parking and loading access to the site will be off of Washington St (along the south edge of the site). Development of Block 40 in South Waterfront. Two buildings are proposed on the site (7-stories each), each with below grade structured parking. Single block mixed use development divided into 2 parcels. Proposal is for new multi-story mixed use building. New construction of a 5-story 17,775sf, with 27 units, mixed use building with 1,094sf of commercial space on the ground floor. Interior trash room. Electrical and mechanical to be deferred. Proposal is to develop the existing parking east of Sears and the site currently occupied by Lloyd cinemas into a mixed use community. Project is for new development on site currently occupied by Lloyd cinemas and the existing parking lot east of Sears into a mixed use community. It will include three “5-over-1” buildings that together contain 520 apartment units. Buildings 1 & 2 share underground parking facility for resident use only. New affordable housing projet (LIHTC awarded through 2016 OHCS): 4-story transit-oriented mixed-use multi-family residential w/48 low-income units, ground floor commercial, & 18 parking stalls. Proposal is to demolish 2 existing one story commercial buildings. Build new affordable apartment project, 55′ tall, 5 story, 66 units, 78,000 sf, plus 2 story, 4 units, 5,000 sf with basement bike parking; total 70 units, 83,000 sf, 32 spaces. Exist community service use to remain, thus inst. Dev. Stds, CU. Project will allow development to proceed with residential development prior to change in zoning from EG to R1 and EX. Project also includes a street vacation. Request is for an adjustment to loading standard for (1) standard a space to (1) standard b space. New core and shell, development of 4-story wood frame construction over a 2-story concrete podium/daylight baement level for workspace. Proposed wholesale or industrial service use on upper levels and proposed retail or office and parking on lower levels. Two stairs and one elevator accesses each floor. Project to be costructed on vacant lot. Properties in question are located at 2638 nw wilson st and 2034 nw 27th ave. There are two warehouses on the property both of which will remaiin.The property has been included in the city’s mixed employment zoning project. Applicant wishes to pursue a zone change in compliance with the comp plan that will result in the same zoning designation for the property that the city has already proposed in the ME project. New 4-story, 50 unit, apartment building with basement garage and ground floor retail. Stormwater is proposed to be disposed of through stormwater planters at the south property line. Ground floor retail/coffee shop space is shell and restroom only, future tenant improvements under separate permit at a later date. New construction of four level(three story plus basement) self-storage facility. Scope includes site improvements, parking and landscaping. S1 and B accessory use. This post originally identified the architects of 2502 SE 29th Ave as Otak. The post has been corrected to indicate that the architects for the project are William Wilson Architects. Multnomah County intends to construct a replacement Multnomah County Central Courthouse. Proposal is for a six story multifamily residential development consisting of 81 units with grd floor retail. PHB project. looking to developed lot for commercial tenant space – retail, office, restaurant. Project if a four story timber structure with retail and workspace on first floor and work space on remaining floors. There are six proposed parking space with a loading zone. St Mary’s Cathloic Cathedral Church – questions regarding developing parking lot into multi family housing and structured parking – with renovation of existing perish hall. Pre-Application Conference to discuss a Type III Design Review and possible Type III Central City Parking Review for the proposed redevelopment of the Oregonian Publishing buildings near SW 17th and Yamhill. The applicant is considering several designs for a project that will include office, retail, housing and parking. 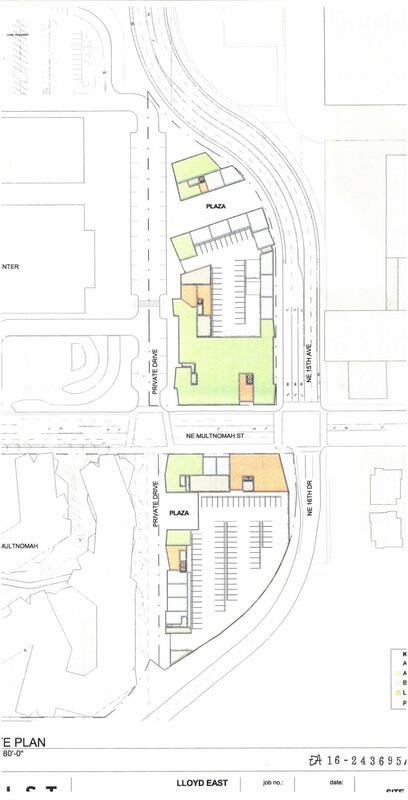 The submitted plans identify 513 parking spaces proposed to support the proposed residential units and the commercial spaces, as well as be available as shared spaces for other nearby uses. No upper-level floor plans or exterior elevations were submitted. The applicant has submitted a list of questions for staff’s response. Additions to exterior church and social hall with interior renovations and parking lot will accomodate non-conforming upgrades and stormwater. Oliver Station is a new five story mixed-use commercial and apartment development on two blocks at the heart of Lents Town Center. 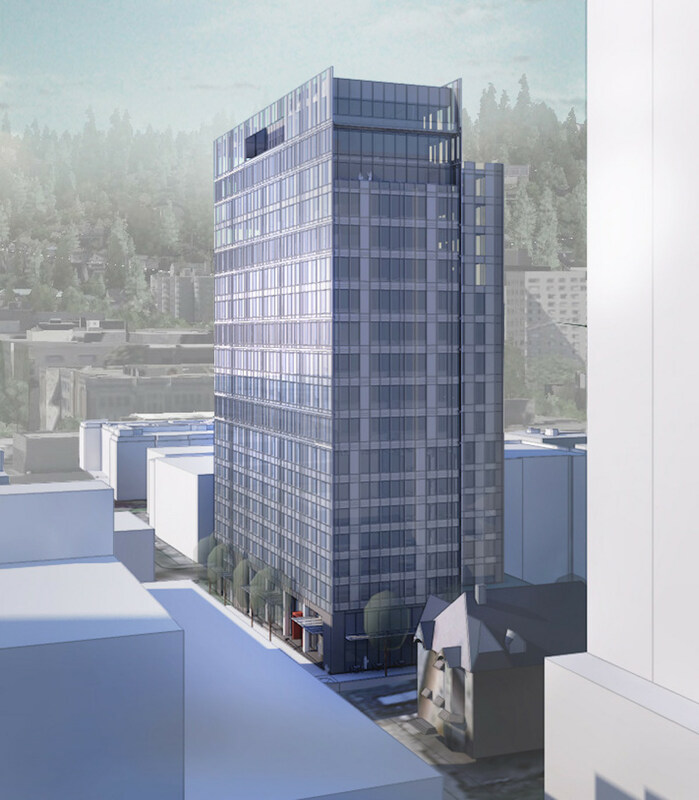 new 12-story mixed-use project. The building will be timber-framed with ground-floor retail, 5 floors of office and the remaining floors in residential use –workforce housing. The rooftop will provide amenity space. Adjustment for loading access, Modification for long term bike parking. Project involves exterior modifications to a National Register (Ballou & Wright Bldg) and its adjacent non-contributing structure on the same tax lot. Project includes one roof deck with elevator override and stair on NR bldg, roof deck on non-contributing bldg, elevation remodel of non-contributing bldg, removal of fire escape ladders on NR bldg, window replacement on NR bldg and modify loading dock and new storefront for ADA access on NR bldg. Type III Historic Resource Review for renovations to an existing building in the Yamhill Historic District. Work includes alterations to both street-facing facades and a partial second floor addition and roof deck. With increase in floor area under 500 sq feet. New 15 story 218 unit residential high rise apartment building including 2 level underground parking garage under this building and extending under the adjacent office building.